This is the updated, early 2018 snapshot of the list of Chrome extensions and apps I use. My own extensions/apps are marked with an asterisk (*). The previous list, from late 2015, is here. to remove news from the timeline that we’re not at all uninterested in. Content & platform companies all love the follow function, and have tried to make it as easy as possible for users to access it. It’s understandable. Apart from allowing easy search, this also presents a straightforward way of targeting advertising to users based on interests. This ability to show relevant advertising – Specialized Shivs to users following IronMan world championships, and the latest BAAS to developers following Google IO – is extremely valuable to these companies. The filter function, on the other hand, is almost universally neglected. None of the content consumption platforms that I use – Twitter, Google+, WordPress and Pocket – offer any easy built-in way of filtering out content. All of them make it trivially easy to follow specifically-tagged content using tags or #tags. A large number of popular 3rd party Twitter clients have the feature to filter out specific content, indicating the strength of user demand for the filter function. That 3rd party clients have this feature, also indicates that technical complexity isn’t the reason holding back content platforms themselves from providing this function. Users want to cut out noise & irrelevant info from their content streams, yet none of the content serving companies make it easy for them. Are there any technical, UX, business, or legal reasons for most content companies not providing filtering functions, or is it just a conscious, unfortunate, neglect of end user needs? Google announces a platform for wearables, inviting its industry partners to conceptualise, design, and deliver actual devices. Apple will release its device(s) – polished, with unified design, closely integrated with rest of its hardware offerings. Google can then choose to let its industry partners respond, or actively force direction with a Nexus watch kind of product. Apple might choose to respond by adopting features from Google where it’s lacking, attacking with lawsuits where it’s leading, and with refining the allure of its own product where it sees the need. It’s a multi step game, one side has huge brand loyalty and an integrated device-platform play, the other has flexibility in strategy and ability to flank. One wants to maximise earnings from hardware sales, other wants more users on its platform. Neither will play for a draw, though that’s a result both will gladly (eventually) accept. Place your bets, buckle up, and get ready for a ride. We need to talk about something. Keyboard Shortcuts. I like both your products. And even if you refuse, despite all the frustration, I will keep using both your products. Yet, I request you, as I must, to please spare me, and thousands of others, the misery of trying to recall two different sets of keyboard shortcuts. Please, our dear software overlords, shower us with some of your infinite kindness, and reconcile your keyboard shortcuts for compose boxes/areas/windows, and anything else they may be used for. As a frequent user of Gmail, Google Drive Documents & Sheets, as well as WordPress, I’m quite tired of remembering 2 different sets of shortcuts. I’m bored with pressing Ctrl-K in WordPress, expecting an insert/edit link box to appear, and of pressing Alt-Shift-O in Gmail and wondering why an ordered list wouldn’t appear. So I, your devoted user, humbly request you to please have pity on my puny brain, and reconcile your respective sets of keyword shortcuts for text composition. Colour – is easy as 1, 2, 3 – red is for errors, blue for information, yellow for warnings, green for the confirmation of success. What does $3.2 Billion buy you? Motorola – a Google company, no more. In August 2011, Google bought Motorola Mobility for a reported price of USD 12.5 Billion. This included cash and credits of about USD 4 Billion. Net price paid: USD 8.5 Billion. After a year and a half of shedding employees and departments, and putting some of its own execs in-charge, Google sold the home equipment business of Motorola to ARRIS in December 2012, for USD 2.35 Billion. Finally, on 29 Jan 2014, Google sold the remaining operations of Motorola Mobility to Lenovo for USD 2.91 Billion. Except the patents. It kept the patents for itself. So, after all the buying and selling ended, Google ended up picking a bill of about USD 3.2 Billion. What did they get for that not-so-insignificant amount? Some, from one end of the tech divide, will tell you they got some dud patents and a hole in the pocket. Google keeps most patents after reviving an ailing player in the Android ecosystem: a Machiavellian scheme if it was all preplanned. Samsung made app concessions, Google left phone hardware & there’s a S/G patent deal. Lots more to this. Reporters, go investigate & report. The truth, I guess, is somewhere in the middle. Google did end up brilliantly reviving an ailing player, one with a strong existing brand, in the Android ecosystem. They still might have overpaid for the patents, though no one will ever really know unless they’re tested in a court. The sale also helped assuage any troubled feeling amongst other players in the Android ecosystem who may have started feeling threatened by a reviving Motorola owned by Google. Individually, none of them seem worth the money. Together, they start to seem like a master stroke. Google got a great deal, me thinks! Posted on January 29, 2014 January 30, 2014 Categories Devices, Mobile PlatformsTags Android, Arris, China, Google+, Lenovo, Motorola, Patents, TwitterLeave a comment on What does $3.2 Billion buy you? Which Came First – Sherlock S3E1 Or Google Smart Lens? On Sunday, 12th Jan 2013, a Sherlock episode airs hinting at the key antagonist wearing a Google Glass like device, except it’s not in his glasses, but in his eye or in his contact lenses. 4 days later, Google publicly announces its Smart Contact Lenses project. Coincidence? Format AsidePosted on January 21, 2014 January 30, 2014 Categories DevicesTags Google+, Not Serious, Sherlock, Smart Contact LensLeave a comment on Which Came First – Sherlock S3E1 Or Google Smart Lens? 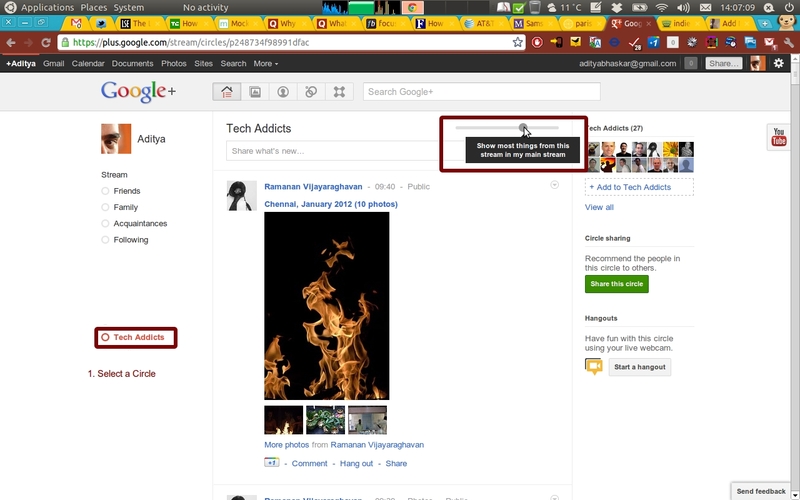 One of the earliest feature requests of Google+ users was for an ability to define the default home stream / circle. Seems like the G+ team introduced this feature without publicity sometime over the holiday period (or maybe I missed all the publicity being away from the Internet for almost a fortnight). Click on the circle link in the left navigation bar to go to that circle’s stream. Once there, you get a slider on the top left of content section to define how many posts appear in the home timeline. Glad to have some way of controlling the behaviour of my home stream. Now that it’s here, it’d be great if G+ provides this filtering function on user basis as well, along with the circle-basis it does now. Now for a note of small concern – when you visit a circle’s page, you realise that the default setting for filtering is ‘Most Posts’, which means some posts may never appear on your home timeline (which is the only one most of us check). While this may be fine if a user knowingly chooses that option, but having it enabled by default means that users may never see certain posts on their timeline, without knowing it could happen. This is similar to what Facebook regularly does, and is regularly criticised for by G+ users. Would be a pity if Google decided to go down that route without informing users first. Most social media users and application developers I know have one big issue against Google+: lack of an API to write posts to it via 3rd party tools. While most might feel this is a big drawback, and someone even called it derisively as the ‘stalker API’, I think this not releasing ‘write’ APIs is a very conscious, strategic decision based on the learning from Buzz. When Google released Buzz, it allowed people to connect some of their existing social networks to buzz and auto-post updates from those networks onto buzz. The problem with this was that most people just enabled that auto-connect and forgot about buzz. Their tweets, reader shares, talk statuses and flickr photos were auto-buzzed, but they never bothered to go in and actively interact there. Add to it the fact that most people who would have read a user’s updates were already following them on other social networks. So, once the followers realised that the users were only cross-posting content there, even they didn’t have any incentive to read the updates there. End result: a zombie network where everyone was ‘posting’ (sometimes even without knowing), and no one was reading. Google has learnt from that experience and thus this reluctance to provide any ‘write’ APIs. Google also learnt something else from that experience – APIs can be used as a tactical tool to position the network in the market and amongst users. And this is where its ‘read’ APIs come: assisting, ever so slightly, in making G+ the core content host for its user base. Using a read-only API, people can auto-post their G+ posts on other social networks, or even list & link them on their blogs and websites. More importantly, using an image-reading API (which Google accidentally announced earlier today), I can use G+ as my photo host for any photos I post on twitter, my blog or almost anywhere else. The 3rd party twitter clients like Seismic, Tweetdeck and Gravity can now integrate G+ image previews using the upcoming API. So we have a situation where users can’t auto-publish content from other networks to G+ (and thus need to be really active here to have an active stream), but they can use content from G+ to post to other networks (thus reducing, ever so slightly, their active participation on those networks). Why wouldn’t Google want that? I’m sure that Google also realises that most people are set in their ways and, without any 3rd party tool integration, will be reluctant to use Google+. And thus, the ‘write’ APIs will come some day. Google is just ensuring that G+ has enough active members using it as the (or a) primary network before it releases those APIs to lure in more users. note2self&others : quick dump of thoughts. Might be edited / formatted later. Every new version of smartphone operating systems (iOS / Android) brings forth a ton of new features. Frequently, these new features include some (IMO) pretty flaky ones like Siri and face-recognition login. I don’t have in-depth knowledge of how Apple and Google decide which new features to include in their OS platforms, but if I was in their place, one way I would like to figure new features would be by addressing pain points. One big pain point I discovered with my beloved Nexus One was that it could be lost / stolen, and once it was gone, I had no way of ensuring that all my data and applications on it could be secured. Yes, after I lost it, I did find a ton of applications that could have possibly helped me in tracking, wiping and even recovering my phone – but it was ‘after’ I had lost it. And that makes these applications slightly redundant. A person has to feel the pain of loss of a smartphone (or a close contact’s smartphone) before realising the need for an application that could have helped recover the lost/stolen phone. I’m assuming that smartphone loss/theft would have taken off with the rise in popularity of smartphones over the last few years. Given the price of many of smartphones these days, losing them hurts. But that hurt can be somewhat lessened with phone insurance. The bigger pain point is the huge loss of data that we keep on these phones, specially if the phone was not locked and the data can be easily accessed by whoever got/took the phone. My question is, given how big a pain point this potentially is, why have none of the major smartphone platform vendors – well, mainly Apple and Google – done anything about it? Steve Jobs famously told Houston that Dropbox was not a product, but a feature. But, in my opinion, if there’s just one functionality that needs to be a feature of the OS/platform and not a 3rd party product, it is this: ability to wipe/encrypt, lock, trace lost and stolen smartphones. Most smartphones these days come with GPS chips and regularly ‘check-in’ with the platform provider’s servers. Tapping into these two features, it should be relatively easy to provide a simple lost/stolen phone service. display a static message on the device stating that it has been reported lost, thus disabled and should be returned to owner / police. The first 2 steps would ensure safety of any user data that was there on the device, and the next 3 will help in recovery of the device. reset the device to factory settings after dissociating all services and user IDs with it. Yes, any smart thief might still be able to bypass all this by simply wiping the device and installing a custom ROM, but a lot of devices could still be recovered and it would help protect user data on the phone from easy unauthorised access. More importantly, bricking phones this way would send out a strong signal to people who find/steal these lost/stolen smartphones that they are worthless bricks and they can have a greater chance of reward from returning them than trying to take them for keeps.